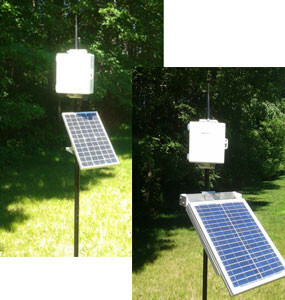 Solar accessory kits allow all Plexus systems to operate independantly of external power. The kits include the panel, mounting brackets, and cable. The 10W panel (approx. 13″ x 8″) is ideal for our new mini RTU solutions, that include pressure measurement, low duty 4-20mA loop measurements and monitoring float switch or 0-5V peripherals. The 20W panel (approx. 19″ x 14″) is use for taking depth measurements using the internal compressor and supporting multiple 4-20mA loop measurements. The 20W panel is also suited to our perimeter probe systems.